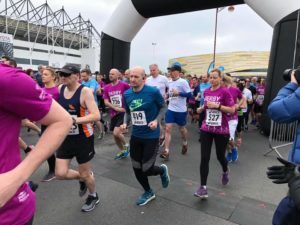 The Derby 10K is a 10-kilometre road race, organised by Derby County Community Trust that starts and finishes Pride Park Stadium and passes some of the city’s iconic landmarks. The inaugural event took place in 2000, and since then thousands of runners have taken to the city centre streets for the annual race. It is Derby’s biggest race and Derby County Community Trust’s biggest fundraiser, raising thousands of pounds to help the local community since 2000. 4,055 runners finished the race with Alex Pitcher of Derby Athletic Club leading home in 31:32. Lisa Palmer-Blount was first lady in 36:20. Only Strider was Nick Scarlett in 40:04 in 133rd position.